Start out by creating a new novice character. After completing the "click to move" tutorial head to the castle. 2. Once inside the castle select the "send me to prontera" dialog option, the training grounds will not help for this testing. 3. 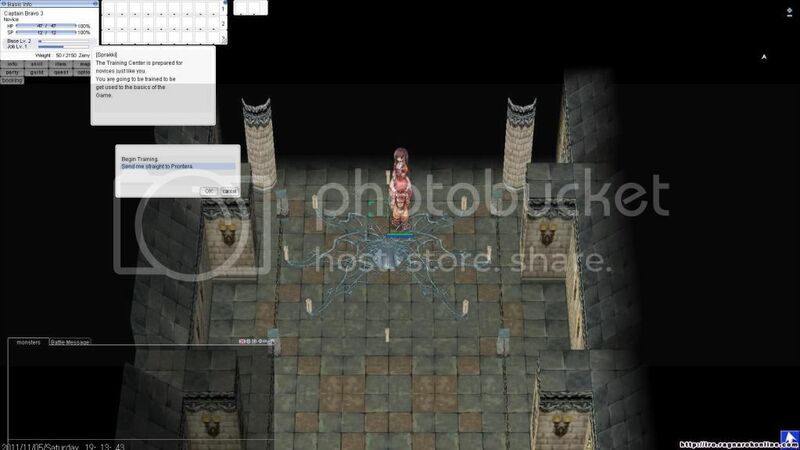 Once you are warped to prontera, speark to one of the class trainer sisters to the north of the centre of prontera. 4. Get zeny by speaking to the Reset Guide NPC to the northeast of the class trainers, he has a "give zeny please" option. - Talking to him will change you to a merchant with max skill points. - Use up all the skill points, then talk to the npc again and will change you to a smith or alch. - Use up all the skill points again and will change you to a trans novice. - ***Note: Last night for some reason, it gets stuck here. So once you become a trans novice, you need to go to alberta and talk to the npc that changes you to a merchant. - Go back to the mechanic-geneticist npc in prontera and it'll work again and change you to Bio or Master Smith. - Use up the skill points again and talk to the npc and it'll finalize you to Gen or Mechanic. Edit: This method doesn't seem to max the lvl to 150 or max job skill points for third class. Not sure if there's a way to do so. Edited by KaneBlueriver, 05 November 2011 - 10:33 AM. I think it's a scripting quirk, that I will report up. i still have to make lvl 10 novice to get out of the training grounds ? Nope. In the entrance npc, She'll (...or was it a he?) either ask you to goto the training room or straight to prontera. Just choose goto prontera. The training is unnecessary. Edited by Pedrov, 05 November 2011 - 06:13 PM. could someone post the sakray download link? oo trying the 13.3 from wiki too see if it updates. Edited by Kenichi, 06 November 2011 - 06:34 AM. You could like, you know, check the homepage. One of the news says "omg sakray shiz"
hehe, thanks. I went to the main site, but went straight to the download site and didn't see the notice. When will the other classes be available? Headgear NPC? Just started sakray today. is sakray down right now? I downloaded it but I can't seem to log on. It says there are currently 3 people online though. I'm having the same issue, so the character-selection server must be buggy right now. Char Servers are still down.. Any news on whats happening? Those only just got added to kRO last week, so obviously no way. You'll have to wait at least half a year and Im being extremely optimistic here. I don't know. We got the ultra novice update quicker than expected. Edited by Luckywhiterabbit, 09 November 2011 - 10:52 AM. Don't you dare call that an update. It was an insult to SN players if anything. The only real thing that has to be done is to receive the patch from kRO, translate it, then implement it into Sakray. That isn't too difficult, and probably why other character updates (as said above,) were faster than anticipated. Edited by Luckywhiterabbit, 09 November 2011 - 11:05 PM. There's more to Ninja than super Supernovice, though. SS Novice basically just uses all preexisting skills, while most of the Ninja ones are at least "new". How to install Sakray? Do I have to install it in the same iRO folder or can I install it somewhere else?